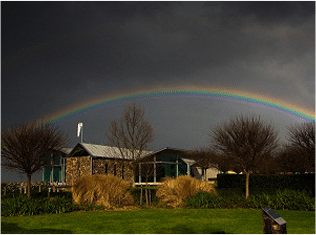 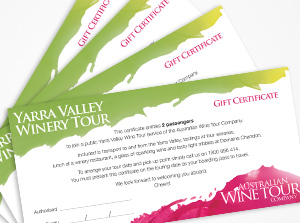 IF YOU ARE LOOKING FOR A GIFT THAT EXUDES FUN AND SOPHISTICATION… AN AUSTRALIAN WINE TOUR COMPANY GIFT VOUCHER IS THE PERFECT CHOICE. 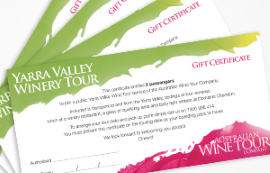 The classy certificate ensures your gift will be appreciated immediately and, with an open date and 12 month validity, there will be plenty of time for your recipient to enjoy their day of indulgence. 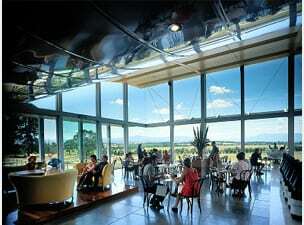 Talk to us about staff incentives and reward programs on the phone or make your choice below from our great options. 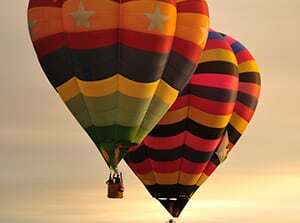 Express post available, please contact Reservations on 03 9419 4444 for more details. 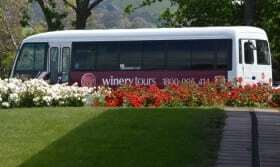 Your privacy is important to Australian Wine Tour Company Pty Ltd. All information provided to Australian Wine Tour Company is treated as confidential. 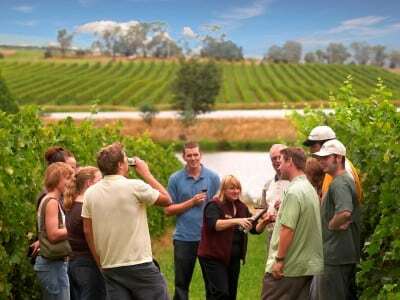 Any details you submit to us from this website or by sending your details to Australian Wine Tour Company on our Forms, will not be passed to any third party and will be used only for the purpose for which you provided them.